Q: What about Milt Tenopir and his methods? RZ: (Laughs) You know, great guy. I truly believe that Tenopir was one of the few guys on that coaching staff who truly -honest to goodness- was one of the few guys outside of Osborne who completely understood Osborne’s offensive system inside and out. One of the few guys who really could just sit down -you could remove Osborne from the equation and from a purely offensive system standpoint, game planning, play-calling standpoint- Tenopir was one of the few guys who could do it as well as Osborne, because he knew Osborne’s sytem as well. Very principled, too. He had a system of how he wanted you to play as an offensive lineman. The big difference -it’s not that big of a difference- is Osborne says, “Dadgumit,” and fifth-year seniors would say “Geez, he hasn’t said that for three years.” Well, Tenopir was one of those guys where you’d get an occasional cursing a blue streak. At the same time, he was one of those few guys who could kind of tread that thin line between being sort of the firm disciplinarian who was running the show and at the same time be a bit of a players coach as well. And it’s hard to do that. There’s not a lot of guys who could do that, and Tenopir was one of the few guys who could do that and do it pretty well, I always thought. Q: And what about Coach Young? RZ: You know, kind of same thing as Tenopir. Unfortunately for Coach Young, he was the passing game coordinator for the offensive line, and at Nebraska during that time period -and granted, it really opened up, and in my mind was the birth of the spread options Osborne started putting in there in the early ’90’s- and even though that offensive system really did open up in the passing sense, in ’93, ’94, ’95 you’re running maybe 20% of your running plays out of the shotgun. It was still a run-based offense, if we were going to beat you it was gonna be the running game, and unfortunately Young’s teaching took a back seat. But the thing about Young, though, he was one of those closet geniuses. And you get a guy who was mathematics instructor as a high school teacher and coach, one of those guys where you sit and talk with him and you get half a sentence out and, literally, three thoughts would come flying out of his head and out of his mouth. And before he got halfway through he’d be off on some other tangent before you knew what was going on. It was one of those things where you had to keep up with him, because he was basically about three thoughts ahead of where the conversation was going. Conversely, just a great guy, a wonderful guy. It’s always funny, because on one hand you have guys like Tenopir who knows the sytem that he’s coaching, but at the same time if you screw up he’s gonna rip you a new one, though you still loved the guy. There was a common theme with a lot of the coaches at the time when you look at Young, Tenopir, Charlie McBride, you had these guys who were gonna rip you if you screwed up in practice -absolutely rip you a new one- but at the end of the practice they were still the guy you wanted to go up and give a hug to. Like I said, it’s hard to find guys like that. Now here, the key point of all of this is, at the end of that day -and any day since- you know what? That same player would take a bullet for McBride and he would love McBride for allowing him to do so. Those two guys, to this day, are still tight as can be, best friends, and have an honest to God love for each other. When you have a situation like that, where a guy loves your coach and the coach is abusive (and the coach wasn’t abusive), but it’s an example of where you have a coach where he can basically, absolutely rip you a new one, and at the end of the day the coach and player still love each other and that player is still willing to run through a brick wall for that coach. You know what, that’s a football team that is gonna be nearly impossible to beat. And it was like that across the board with the offensive line and Tenopir, and the QB’s with Osborne, the linebackers with Steele. (Then again, it might have been more of a fear thing with the linebackers and Steele) (laughs) But there was an honest-to-God love between the coaches and the players, and when you can foster that across a team, it’s gonna be nearly impossible to defeat. And we had that all through the ’90’s when I was there. I loved the guys I played with, on both sides of the ball. That was kind of the goal with the huge push towards unity in the early ’90’s with the Unity Council, Osborne starting the TeamMates program, and I think the success we had on the field was a big part of that. And at the same time, you have to give credit to the schemes the coaches came up with. The fact that Osborne went from a pure power option running game to his sort of hard-to-define shotgun forerunner of the spread option that nobody had any clue how to defend, literally a decade before Urban Meyer or Rich Rodriguez or any of these other guys out in the field. And he still doesn’t get any credit for it. I’m absolutely convinced Osborne came up with it. We were running fullback traps out of the shotgun, were running QB option keeper, QB passes, like a play where the QB could hand it off, run it himself, pitch it to the running back or throw it to the tight end. All on one play! And we’re running it out of the shotgun, how do you defend that? Osborne came up with stuff. But how? We were running the old counter trap out of shotgun, and Osborne came up with all this stuff. I remember back around ’92, ’93 when he started it, we were, ”What is he thinking?” Now, like I said, you’ve got all these so-called gurus running the spread option that Osborne pioneered a decade and a half ago, and at the time everybody said he was ‘archaic’. Back then they were calling this stuff obsolete and archaic, and he was literally 20 years ahead of his time. The same thing with the defense, the switch from the 5-2 to the 4-3 look and the push for speed, I think everybody nationally was kind of moving that way. I remember that 4-3 initially started as our nickel and dime package to defend against the pass. And all of a sudden they noticed teams had trouble running against it, too. Here you had these pro-style, shotgun passing offenses and they just said, “Hey, let’s just leave them in there for that and the running plays, too.” It was peachy keen. Q: Plan B became Plan A? You think about my senior year in ’94: Tommie goes down with the blood clot issues and is out a portion of the year, and you have a guy in Brook Berringer who doesn’t have the shifty, elusive quickness that Frazier had, but he’s got a true NFL-caliber arm. An honest to goodness NFL-size, NFL-caliber arm. He’s a 6’4”, 210 lb. guy and he had a 40 yard dash time that was actually faster than Frazier’s. He wasn’t shifty, but he was fast and smart, and a real nice guy, I always thought. So Osborne was, ”Lets take the offensive system and let’s fit it to Brook’s talents.” And all of a sudden we were running so many plays out of shotgun that year. It was literally the QB option keeper to the sideline, just take the ball and read that angle to the sideline. And a guy with Brook’s speed is gonna get you 4 yards a pop every single time, which if you do that 3 plays in a row, that’s 12 yards and another first down, and then 80 yards later you’ve got a defense that’s sucking wind. Then, of course, you’ve got a QB with a punctured lung, too, to even things out. (laughs) But Osborne, which impressed me, was always willing to bend the system to the talent he had. And so many other coaches always seem to want to bend the talent to fit their system. And Callahan, when he was at Nebraska, was a ‘system’ guy: “Here’s my system, and if it’s not working it’s because the players don’t fit the system. The system is not wrong. The system is 100% functional.” But you saw the first year he came in to implement that system, Nebraska had its first losing record since 1961 because Callahan insisted upon turning a group of players talent-wise who were completely, wholly built for a run-based offense and tried turning them into a West Coast-style passing offense. The other knock against Callahan was that he tried to call plays. And his system wasn’t that bad. It wasn’t great, but it wasn’t that bad. One of his weaknesses, though, was that he wasn’t that good of a play caller and game manager, which happened to be another strong suit for Osborne, just making adjustments during the course of the game. He was very, very good at that. Callahan, not so much. And you tend to see more of that in the NFL. You come out with a game plan in the first half and if the other team makes adjustments at halftime (in the NFL so often you don’t see guys making the halftime adjustments to counteradjust) and in college it was one of those things where even if the game plan was working stupendously during the first half, we’d come out of that halftime with a gameplan that was completely backwards from what we did in the first half. Even if things were going right! Because Osborne would anticipate them working on the film clips and the still shots and make adjustments. Well, we’d come out and not do exactly what we did the first half. He wouldn’t do a wholesale switcharound, but he’d change things up enough that the opponent had a whole new set of things to deal with that he hadn’t seen yet. I think Osborne was always good in the first half -and you never really saw it as a player or a fan- but every few plays was a “test the water” play that he’d throw in there, something that maybe the guys won’t be able to deal with. Not really try to gash them with it, make hay with it, but test the waters and see if they’re gonna be able to react to this or not. And if you’d do that and the opponent did not react to it in an appropriate fashion, you can bet Osborne would come out in the second half and just hammer you with those plays. And Callahan, here you had someone so in love with their system where instead of making changes you just ended up losing games. And you talk about that book you read, with many organizations and many systems? The successful ones are the ones that look at who they have and what they have to work with and say, “How do we become successful with what we have here?” instead of “bending everybody’s will” to the system. Osborne was so good at identifying and maximizing talent and then both at long term and short term adjustments -late second quarter, mid-third quarter- and change it if it was working okay, but could have been done better, and implementing those changes in the immediate here and now. Osborne was just a genius when looking at his system over the long term. People called him an offensive genius when he was Devaney’s offensive coordinator, and the sytem he ran with Devaney was a typical pro-style offense with a lot of passers: Ferragamo, Tom Sorely, David Humm, Van Bronson, Bruce Mathison. It was a passing offense, and then the whole running game, option thing didn’t come along until basically Turner Gill hit the door in ’80 or ’81 and he switched to the running game: “Maybe Barry Switzer has something going on over there,” you know? Q: Is there anybody the average fan should know about because of the contributions they made to the team? RZ: I think Jack Stark is a big one, just in terms of the work he did with the players. And it’s one of those things where sports psychology, it was around and it was in use before Jack Stark hit the door down in Lincoln, but he was a guy who revolutionized it, at least for Nebraska, and took it to a whole other level. In terms of a behind-the-scenes guy working with players and keeping some guy’s heads on straight, keeping the unity and working toward the common goals, Jack did a solid job. He’s one guy. I think the strength staff: hugely instrumental, but at the same time I think that’s something most football fans have a good grasp of. Everybody knew who Boyd Epley was, with the strength program growing up in the ’70’s and in the ’80’s. 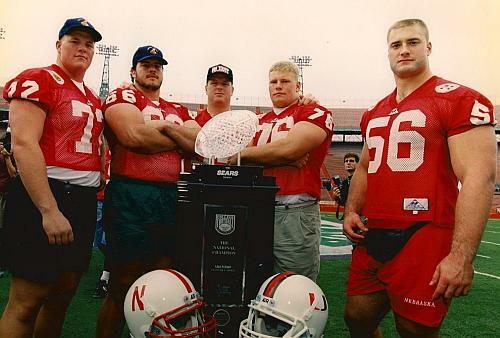 One of the big things that’s been instrumental (and Osborne made the reference in a conversation I had with him over a year ago now and as Athletic Director), I remember Osborne making the point to me to make a big effort to re-establish Nebraska ties, like the walk-on program that got severely restricted under Callahan. Osborne said he wanted to make a big push for that. And Osborne made reference to that, how all three of the National Championship teams (and I haven’t checked his numbers, because Osborne is kind of like God: you don’t test the guy) (laughs), but Coach Osborne said, “You go back and look at both National Championship teams and approximately 70% of those guys were local guys, from Nebraska and the surrounding states.” Osborne said what that did, not that 70% of the starters were local, but 70% of the team were local. Some of those guys were big name recruits from Florida, California, New Jersey, of course, but he said, “You don’t have to have all the starters be local, but whatever team it is it definitely helps if you have a majority of the guys on the whole who are local. 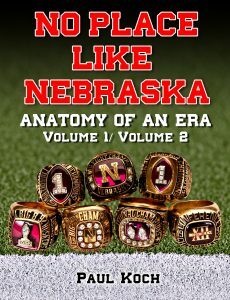 And what it ends up doing is that it gives the team a vested interest in the University and the state and in the program itself.” And so, 70% of the team grew up living and breathing and dying to wear Nebraska Red. And if you do that, the guys from California, Florida, Texas will do the same, as well. Tommie still lives in Nebraska, Stai lives in Nebraska. All those guys not from Nebraska still live here and work here now. Lawrence Pete is not from Nebraska, he lives and works here in Omaha. These guys who go off and play in the NFL, why do they move back to Lincoln or Omaha? You just get the entire team as a whole invested in it all. I remember the 2007 season, Nebraska plays Oklahoma State and just gets absolutely routed at home by a fairly mediocre Oklahoma State team. Talented, but mediocre as a whole, and Steve Pederson gets fired the Monday after the game, and the TV cameras pan the crowd and before halftime fans are just running out of Memorial Stadium. Paul, it was sad. People weren’t angry anymore, they were sad. It was the straw that broke the camel’s back. Anyway, a World-Herald reporter manages to snag a fan at a post-game tailgate right after the game and asks him his thoughts. And it was a very simple comment and simple observation, but it was profound, too. He said, ”All these players the coaches brought in to play here, and the coaches themselves, they came to play at Nebraska and not for Nebraska.” I remember reading that in the paper and I got chills reading that. I was, ‘Oh my gosh, he’s right.’ Then I got really depressed, because I remember that in college we played for Nebraska. It was for Coach Osborne. You didn’t come here because it was your stepping stone to the NFL.